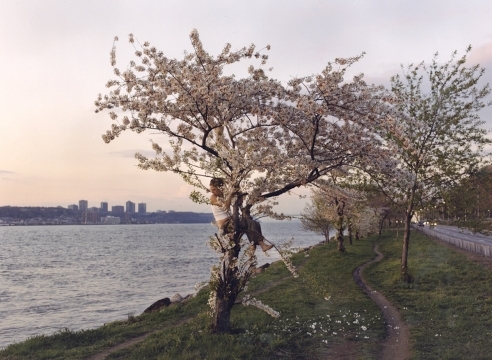 Mitchell-Innes & Nash is pleased to announce Justine Kurland's inclusion in Into the Sunset, opening March 29th at the Museum of Modern Art, New York. Into the Sunset brings together over 120 photographs made by a variety of photographers. These works illustrate photography's role in popularizing ideas of the sublime landscape, Manifest Destiny, and the "land of opportunity," as well as describing a more complex vision of the West, one that addresses cultural dislocation, environmental devastation, and failed social aspirations. Organized thematically, Into the Sunset includes photographs dating from the nineteenth to the twenty-first centuries, incorporating a range of artistic strategies, motifs, and concerns, and featuring the work of approximately seventy photographers, including Robert Adams, John Baldessari, Dorothea Lange, Timothy O'Sullivan, Cindy Sherman, Joel Sternfeld, Edward Weston, and Carleton E. Watkins. The exhibition is accompanied by a fully illustrated catalog. 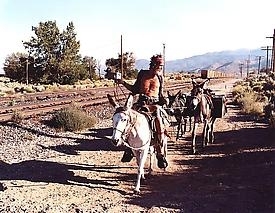 JUSTINE KURLAND Astride Mama Burro, Now Dead 2007 C-print 40 by 50 in. 101.6 by 127 cm.